Who’s using eHealth and mHealth? In March 2014, the European Commission reported on two surveys regarding the extent of use of eHealth tools in hospitals and among GPs in Europe. These reports were followed, in April, by the release of a green paper on mobile health (mHealth) that will serve to launch a broad stakeholder consultation on existing barriers and issues related to mHealth deployment. 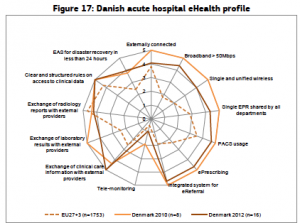 The hospital survey used indicators to construct an eHealth profile for each country. The 13 indicators cover four thematic areas: Infrastructure, applications: (EPR, PACS, ePrescribing, eReferral telemonitoring), integration (exchange with external providers), and security. The profile is presented as a spider diagram on which a country’s results in 2012 are compared to 2010 results and to EU-level results for 2012. These diagrams have scores ranging from 0 to 5, which respectively correspond to a 0% to 100% implementation rate. 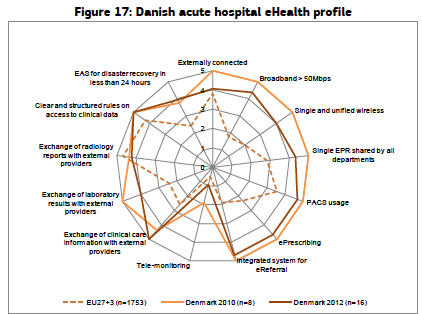 Denmark leads the way, with eHealth uptake in hospitals at 66%, and comes second behind the Netherlands (83.2%) in digitisation of patient health records at 80.6%; the UK stands at 80.5%. very little use of health information exchange, telehealth and personal health records. GPs mentioned a lack of financial incentives, interoperability, and clear regulatory framework on confidentiality and privacy as barriers to using more eHealth functionalities. Details are provided on use of each category of eHealth tool to show which functionalities have been most widely adopted by GPs. Within the EHR category, 92% of EU GPs routinely use EHRs for prescriptions, 80% to order tests and only 25% for radiology test images. Most often, GPs stated not having that capability in their EHR. In terms of health information exchange, 64% of GPs routinely receive lab reports, 32% send and receive referral and discharge letters, while less than 25% transfer prescriptions to pharmacists and only 14% use eHealth to interact with patients. Telehealth has made small inroads in training and education, with 16% of GPs using it routinely and another 19% occasionally, but only 4% routinely use telehealth in patient consultations and 1% to monitor patients in their homes. Personal health records (PHR) are still in their infancy, with less than 5% of GPs stating that their patients use PHRs to supplement medical records, view test results or request referrals; 13% routinely use them to request prescriptions or appointments. How does use of eHealth among Canadian GPs compare? The Commonwealth Fund 2012 survey found that 56% of Canadian GPs are using EMRs, up from 37% in 2009. Infoway’s 2013 Annual Report states that all provinces have diagnostic imaging systems in operation, 6 have drug information systems in place and 6 have laboratory system up and running. Along with their Australian counterparts, Canadian GPs were least likely to report offering their patients electronic access. Information sharing between health professionals was also low in Canada compared to other countries. The US and China stand out as eager adopters of mobile technology (mHealth) to transform healthcare, according to a report from the Centre for Technology Innovation at Brookings. In the US, mHealth is often used to reduce costs, while in China, a main purpose is to increase access to primary care. Monitoring accounts for 65% of the global market opportunity in mHealth. The main policy challenges identified in the report include restrictions on how mHealth can be used (China allows consultations, but not prescriptions or treatment), limited reimbursement for the provision of mHealth services, and uncertainty regarding when mHealth products need to be regulated as medical devices. Richard Alvarez (Canada) : What happened to the last billion dollars in health information technology? Charles Gutteridge: Can health information technology liberate the UK’s NHS?